As this year comes to a close, I still have one little trip planned for next week. My friend, C-Dogg B-Dizzle, showed some interest in visiting nearby Monroe and Greene counties to see the places where her B-Dizzle ancestors first came to Indiana. 1.) Darke County, OH – Again. I have already been out there this past year, but there is SO much research to be done on my Dad’s side and Andrew’s Mom’s side. I could do work there for an entire week. Maybe I’ll get crazy and even find a cheap hotel and do an overnighter. 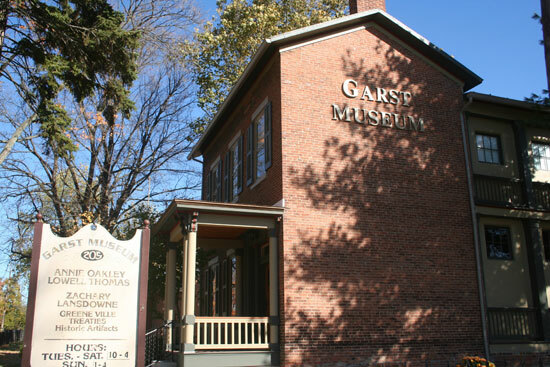 Garst Museum in Darke County (Greenville, OH) where researching ancestry is made easy by great help! 2.) Keithsburg, IL – This is the farthest back I can get in the Nelson branch. While I know that James A. Nelson was born in Kentucky, and spent some time in Indiana, he was last heard from in Keithsburg, IL, a town along the Mississippi River. What worries me is that Keithsburg, and much of Mercer County, has a horrible habit of being flooded. I am afraid that records will be scarce. We shall see. While taking a trip to Keithsburg I am determined to stop in Springfield on the way and visit the Lincoln attractions. I am gonna nerd it up ALL the way. 3.) Pennsylvania/New York – Pennsylvania has very poor online records, which is unfortunate for me because my Mom’s entire family came through Pennsylvania. I would really like to have a Scranton, Lock Haven, Laceyville, Binghamton NY trip. One thing I am really interested in seeing are some buildings in the Binghamton area that my ggg grandfather built, as he was a regionally known architect. At one point I had a whole map created about the route to get there, where to stop, and where to stay. I think it’s perfect for a summer trip. 4.) Local libraries. I still have not gotten to the Indiana State Library. Shame. Also, the Ft. Wayne library is KIND of calling my name. It’s supposedly the biggest genealogy section outside of the Salt Lake City collection. 5.) Union, SC – This is kind of the stretch. I very highly doubt I’ll make it to South Carolina, but this is the absolute farthest I have been able to trace my Brown family online. Some fellow named Alexander Brown left Union, SC and settled the family in Darke County, where many still remain today. I would LOVE to get down there. If not this year, maybe next. Happy Holidays! Here’s to a new year of research excitement and adventure! This entry was posted in Travel and tagged ancestry, Darke County, genealogy, Indianapolis, Keithsburg, New York, Pennsylvania, Scranton by amanita. Bookmark the permalink.